Source: CICH graphic created using data adapted from Public Health Agency of Canada, Canadian Chronic Disease Surveillance System 2000-2001 to 2010-2011, customized analyses. 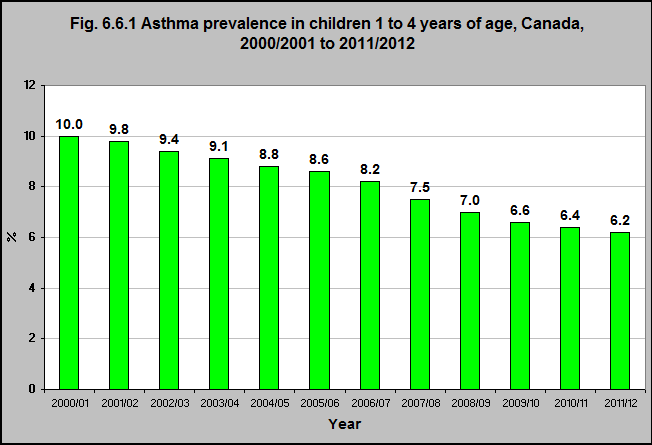 According to the Canadian Chronic Disease Surveillance System, asthma prevalence in young children has been steadily declining since 2000 with 6.2% of children aged 1 to 4 having asthma in 2011/2012 compared to 10% in 2000/2001. 1Millar WJ, Hill GB. Childhood asthma. Health Reports (Statistics Canada, catalogue 82-003) 1998; 10(3): 9-21. http://www.statcan.gc.ca/pub/82-003-x/1998003/article/4137-eng.pdf– accessed March 15, 2017.